Fresh from the oven and bathed in the morning sun. What could be better? It’s a bright, clear morning in the country.The temperature is already higher than it has been all week and the birds are singing the sun higher in the sky. Complete relaxation. And moist, chewy bread is just out of the oven. What? Wait? Relaxing while making bread? Warm bread and butter. Oh, how we suffer. Yes, if you follow my method. Almost all of the bread I make takes little to no effort on my part, and that’s the way I like it. Who wants to knead a lump of dough for 15 minutes when it’s actually not necessary? You can get stellar results another way. It’s called autolyse. That’s the technique where bread dough (or sometimes just flour and water) is allowed to rise for an extended period (overnight). During that time the moisture in the dough realigns the gluten strands in the wheat. Of course there are some breads that you have to knead to get them right, like many named European breads, but more than adequate results for country-style loaves can be achieved with no kneading. Or proofing yeast. Yup. Just mix everything together and go to bed. In the morning you’re ready to shape, rise again and bake. This one’s a little different in that part of the flour has been replaced with 12-grain cereal for sort of a cracked wheat/whole wheat loaf. You can buy just the amount of 12-grain cereal you need at bulk food stores, like the Bulk Barn in Nova Scotia. 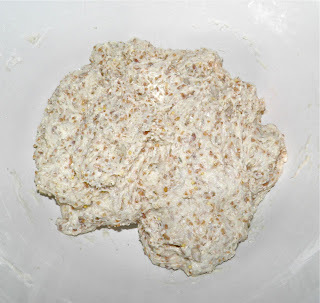 The dough just mixed, ready for overnight rising. Their 12-grain cereal contains cracked wheat, rye meal, steel cut oats, cracked triticale, hulled millet, barley flakes, thick flaked oats, brown flax seeds, buckwheat grits, white sesame seeds, sunflower seeds and golden flax seeds. It’s usually cooked like porridge for breakfast, with apple and/or cinnamon added. It’s quite a nutrition boost. The Bulk Barn also sells 12-grain flour, but I wanted the crunch of the cereal. I am finding there’s so much you can do with bread to make it interesting, nutritious and delicious. A simple substitution here and there can really add variety to your diet. I should list my other breads here so you could check them out, but they’re getting too numerous to count. Do a search for “bread” on this site (close to the top, at right) if you're interested. There's some really good recipes. I have said this before, but since moving to the country, 3-1/2 months ago now, we have yet to buy a single loaf of bread. I have also probably spent no more than 30-45 minutes kneading during the entire time and we have had fresh bread almost constantly. So there’s really no excuse for not breaking out the yeast and flour and saving yourself some cash. 12-grain loaves would run you close to $4 at the grocery, if you could get it. You’re also avoiding preservatives. Ready to be proofed again in the morning. Besides being money and health conscious, there’s no smell I can think of that’s better than bread baking in a sunny kitchen. Maybe warm bread with butter. Mix all of the ingredients together in a bowl. 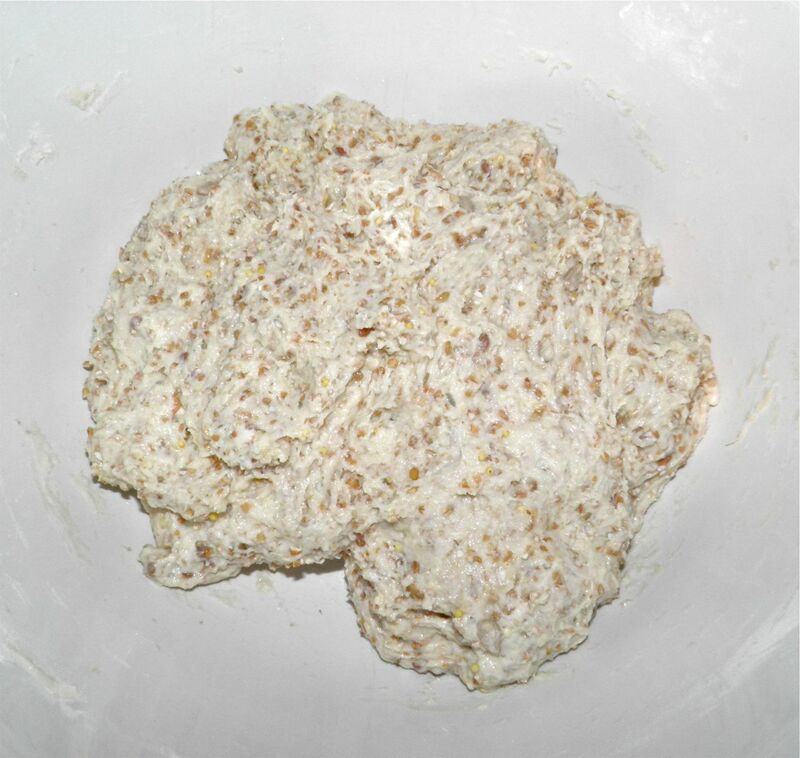 Knead the dough briefly, about 1 minute, to bring it all together. a final "push" in the oven, making it rise even more. 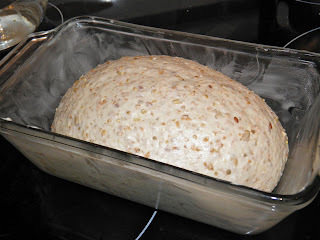 Cover with plastic wrap and a towel and let rise overnight. 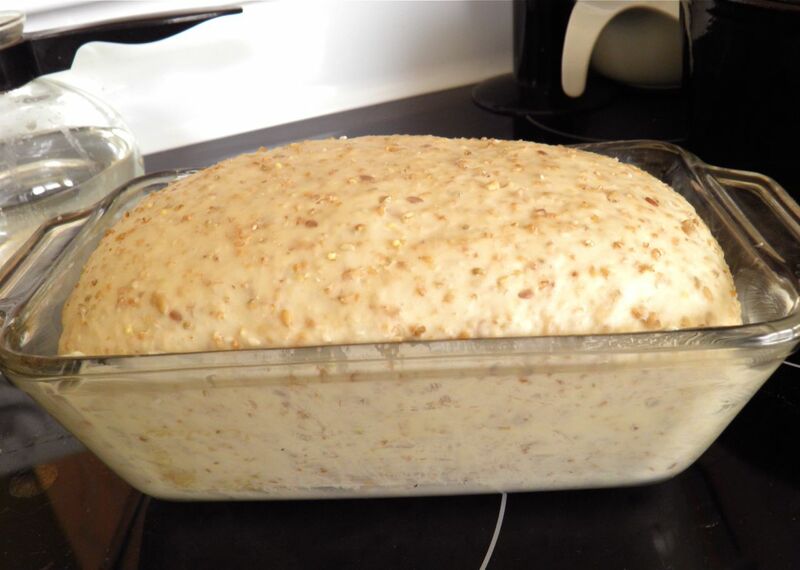 In the morning, punch it down, knead for another minute and shape into an oblong. Grease a 5” x 9” bread pan. Place the dough in the pan and let rise until doubled. Preheat the oven to 425°F, with a pan of water on the lower rack. Once doubled, bake the loaf for 30 minutes total, removing the water pan after the first 10 minutes. The bread will be done when dark nut brown on top and hollow sounding when tapped on the top. Let cool at least a little before slicing. Hi, I noticed there is no salt in this recipe? Is that correct? :-) Good catch. 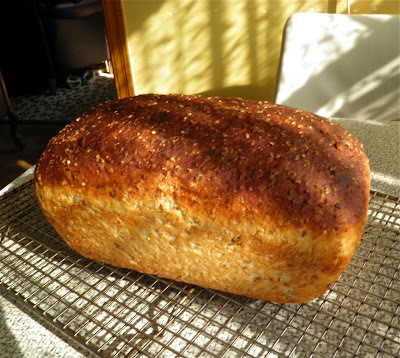 You can make bread without salt, but it won't stay fresh as long and the taste isn't as robust. So since it's 1 loaf, feel free to add 1 tsp of salt. (In other words, I missed it... it's in now). Thanks...trying it tonight so I'll report back tomorrow. Plus I didn't have 12 grain...ended up more of a four grain of what I had laying around lol. Turned out great! Nice crispy crust with great flavour. 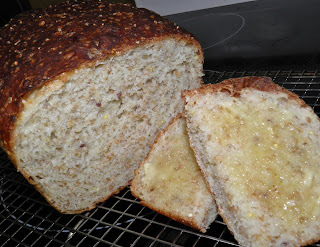 I used some coarse cornmeal in the grain mix, steel cut oats, bran and spelt flakes. Yum!